Mantua Greenway Community Build Day! 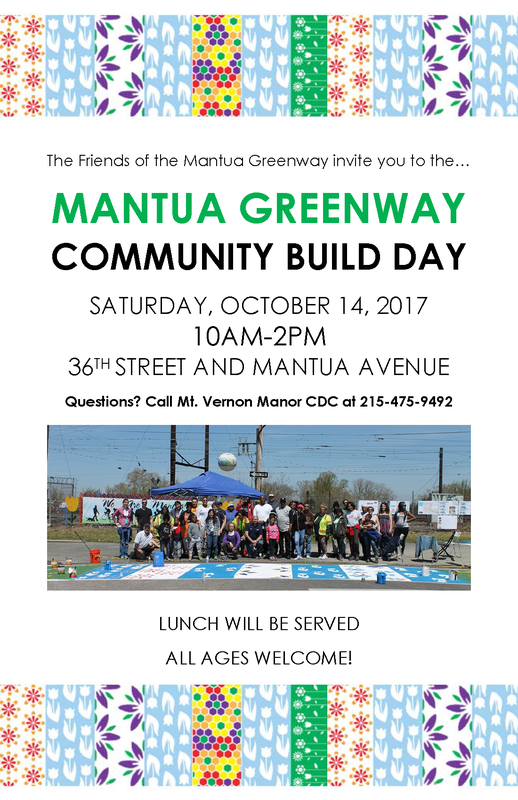 The Friends of the Mantua Greenway can’t wait to see you and your family, friends, and neighbors at our 2nd Community Build Day on Saturday, October 14, from 10AM-2PM! We’ll be working together to paint crosswalks connecting Miles Mack to the future Greenway and painting the park’s retaining wall. Come through to have a great time with the commnity and make a great impact! Previous Previous: Sept. 28: Next Community Briefing! July 27 Community Fun Day! June 16 – Health Is Wealth Community Workshop! April 9 East Parkside Community Workshop! FREE Income Tax Prep at MVM!